Vikings: War of Clans is a free to play browser based MMORTS where each player steps into the boots of a Viking Jarl, ruling over their town and clan, they will engage in strategic combat, build up their own town, gather important resources, field a Viking army and take the battle to the AI enemy and other real world players. The game can be played for free and is accessible through web browser and doesn’t require a client download. The core of the game focuses on the acquisition of resources and managing your own time to establish a town and create an army not only capable of defending it from your enemies, but also enough to raid other areas for resources and rewards. With automated combat the strategy comes down to choosing what buildings to place in your town, which types of units to priorities in your army, managing your resources and time efficiently, and choosing your battles wisely! Constructing and upgrading buildings, researching knowledge, training up troops, and other tasks can take minutes and sometimes even hours to complete, with only one choice being available for each queue type at a time (eg. Only researching one tech, constructing one building, training one type of troop), though these do continue to be worked on even when the player is offline. Each player takes on the position of a Jarl, but more than just being a figurehead the Jarl "Hero" can be upgraded and improved through various means including upgrading their personal home to increase their stats, influence and other key characteristics, or crafting and discovering new items that they can equip to increase their proficiency when aiding troops in battle. As a Jarl gains XP and levels up they will also acquire Hero Skill points to spend in an exclusive tree, an extensive list of skills that when unlocked will give players various benefits for their town and troops. There are dozens of buildings for players to construct and upgrade within their town, ranging from wall fortifications to defend against attacks, barracks to train up a military, the Oracle's dwelling that will increase the speed that new Knowledge (technologies) are unlocked, and various production buildings to create new resources. Buildings can be upgraded to improve their general efficiency, but none can be higher in level than the town's Palace structure. Different types of buildings can be constructed on specific plots of land, but the number of each building that a player chooses to construct comes down to their preference and strategy. Through the Oracle (and his structure) players can unlock dozens of different technologies, or "Knowledge", broken down into different categories such as Espionage, Economy, Military, Invasion and Training, players can choose what they wish to primarily focus on when improving their town and forces. There are dozens of available Knowledge techs to unlocks, each of which can be upgraded to make it even more powerful. 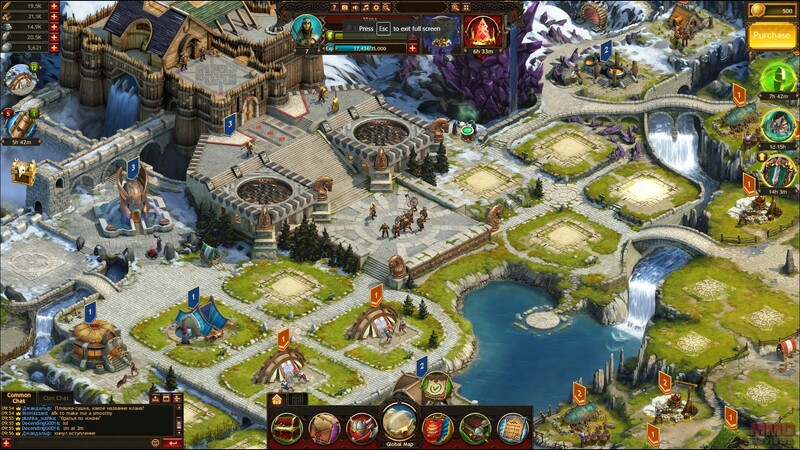 The aim of the game is conquest over the AI and, more importantly, over other players, done through attacks and raids on rival player towns, invading AI units or various AI farms and settlements. The game will automate battles (which can be reviewed later) and determine the victor based on the composition of both armies, their units, number, upgrades and Hero Skills. Players can work together and form alliances or go completely solo, but those who go at it alone are vulnerable to larger groups that will conquer their holdings. With each battle comes a full battle report to inform the player of their win or loss, what causalities both they and their target suffered, and what resources their attack was able to recover. Looking for more Free MMO Browser-based games,Free MMOs games?